Clinical Neuropsychological Foundations of Schizophrenia is the first practitioner-oriented source of information on the neuropsychology of schizophrenia. This volume demonstrates the growth in what is known about cognition in schizophrenia, its assessment, and how this informs clinical practice. It provides the practicing clinical neuropsychologist, and other professionals working with persons with schizophrenia, with the knowledge and tools they need to provide competent professional neuropsychological services. 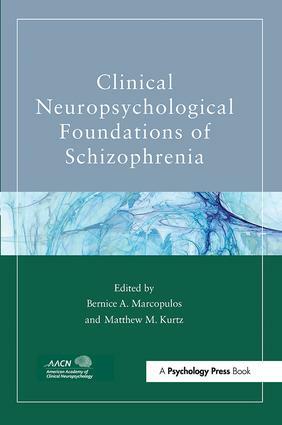 It includes an overview of developmental models of schizophrenia and its associated neuropathologies, so that the clinician can fully understand how vulnerability and progression of the disorder influence brain development and functioning, and how cognition and functioning are associated with these changes. In addition, the volume covers contemporary evidence-based assessment and interventions, including cognitive remediation and other cognitive oriented interventions. Throughout, the research findings are synthesized to make them clinically relevant to clinical neuropsychologists working in outpatient or inpatient psychiatric settings. The book is an invaluable resource for practicing professional neuropsychologists, clinical psychologists, psychiatrists, and neuropsychiatrists, as well as graduate students of these disciplines, interns, and postdoctoral residents and fellows who work with schizophrenic patients.